Couple falls pregnant with two boys – and they’re only 3 weeks apart! Married couple Toby Fleischman and Lindsay Lanciault had two little bombshells to drop on Instagram last month. Both women unexpectedly fell pregnant, with boys, and they’re just three weeks apart from each other. One couple, two tummies, two babies. Wow! 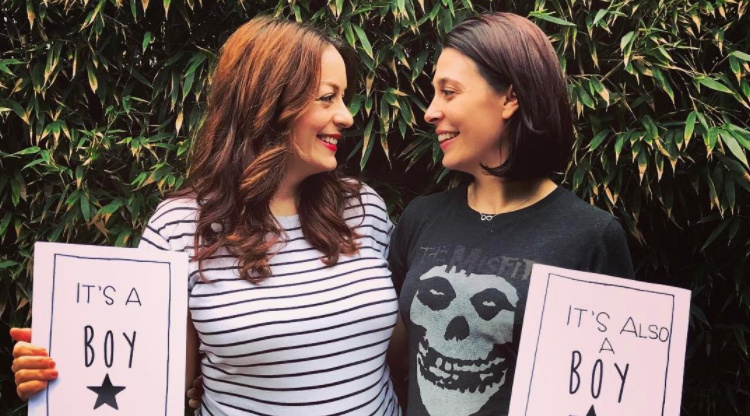 In their post, the two women each held up a sign: ‘It’s a boy’ and ‘It’s also a boy’, while their dog Liz Lemon looks on with a ‘Big Sister’ sign around her furry neck. We're excited to share some news…Lindsay and I are both pregnant! Yes, you read that correctly. We are both having a baby….at the same time. Well, three weeks apart to be exact. Everyone always says they want to get pregnant with their best friend and I just happened to be lucky enough to be married to mine. Our "twin" boys will be joining us this summer and we couldn't be more elated! Talk about impeccable timing. What makes this story extra special is the fact that Toby endured a very difficult path to pregnancy. After falling pregnant in 2015 with the help of a sperm donor, she sadly miscarried shortly afterwards. The setback was a shock to both Toby and Lindsay, and as a couple they turned to acupuncture to try to heal and refocus their energies. When they eventually decided to try to fall pregnant again, the results were unexpected. Turns out the acupuncture and soul-searching worked some kind of magic, because by late last year, Toby and Lindsay found out they were both pregnant, with barely three weeks between them. So far, the tandem pregnancies are going well. They’re each craving fried food and pasta, but with two growing bellies, hugs are getting a bit more challenging. Plus, they’re trying to get their dog Liz and cat Cleo prepped for the arrival of two new house mates. A lot of women can relate to the loss and shock that Toby and Lindsay went through. Hopefully this is a beautiful reminder that life can have a few sweet surprises in store. It’s also a really timely reminder of the challenges the LGBTQ community faces when it comes to starting a family. Here’s hoping lots of other couples like Toby and Lindsay will get to grow their gorgeous families.